New Italian ambassador to Egypt Giampaolo Cantini will arrive in Cairo by beginning of January, to submit his credentials to President Abdel Fattah al-Sisi, according to sources from the Italian Foreign Ministry. Italy is keen on returning its ambassador to Egypt, as there has been no ambassador in Cairo since April since Maurizio Massari was recalled in the wake of the murder of Italian Researcher Giulio Regeni, whose body was found in February, the sources said. There has been interest in resuming ties with Egypt, especially after Egyptian investigators who traveled to Italy last month made promises to uncover the truth behind Regeni’s death. Former Italian Prime Minister Matteo Renzi declared in May the appointment of Cantini as the new ambassador to Cairo. In related news, La Republica published on Friday remarks of the new Italian Prime Minister Paolo Gentiloni expressing his country’s desire that its ambassador returns back to Cairo soon. 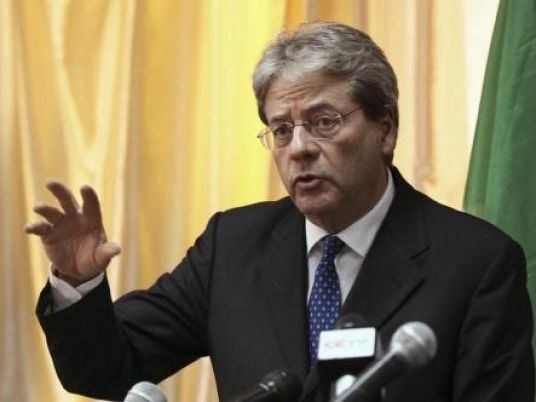 The newspaper quoted sources as saying that the way has been cleared now for Gentiloni to send an ambassador; especially after interrogators, headed by Public Prosecutor Nabil Sadeq, who visited Italy last month, promised to unveil the real perpetrator behind the death. The newspaper also added that Egypt's new ambassador to Italy, Hisham Badran, will not carry out his duty before Italy sends its new ambassador to Egypt. Meanwhile, Italian reports expected the country's leftist wing to reject sending an Italian ambassador back to Egypt before official investigations are over and Regeni’s murderer is revealed. The leftist wing is planning a protest in Rome with the participation of leaders from the human rights organization Amnesty International on January 25, to mark the first anniversary of Regeni’s disappearance. March 2016 – Italian Public Prosecutor visits Egypt. September 8th, 2016 – Egyptian Public Prosecutor visits Rome. November 1st, 2016 – Italian deputy prosecutor visits Egypt, meets with Egyptian public prosecutor. December 6th, 2016 – Egyptian public prosecutor visits Italy, meets with Regeni’s family.